Land Rover is quite serious with its commitment to going green as it recently rolled out an all electric version of the Defender. Yes, that is the big SUV you are thinking of right now. Well, according to a spokesperson, the all-electric Defender is not yet due for production but is a way for the brand to test the technology. The electric Defender will be the laboratory on the go of Land Rover as they try to see if ever it will be possible for the off-roading realm to go green. It will be tested in all possible terrains and conditions so they can see if the technologies can be implemented on future models. The SUV is aptly called Defender All-Terrain Electric and derives its DNA from the latest 2013 version of the Defender. It is engineered to have zero emissions while retaining the innate ruggedness of the vehicle. The diesel engine and the transmission of the Defender were dropped in favor for a 94-horsepower electric motor. This single motor is dependent of a lithium ion battery pack with a rating of 27 kilowatt hour that gives the vehicle a driving range of at least 50 miles on moderate driving. When used for your typical low-speed off-roading adventure, the electric Defender can give the driver around 8 hours before needing a recharge. A fast charger can juice up the battery in just four hours while a smaller charger with a lower rating will require 10 hours. The SUV is about 240 pounds heavier but going to deep fords will never be an issue. 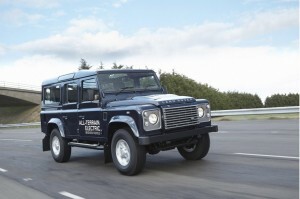 The four-wheel drive capabilities and the differential lock of the regular Defender were retained. Aside from the engine being replaced by the electric motor, the new green Defender only has a single speed. This is so because the max torque is already delivered by the system the moment the engine is started so the driver does not have to shift gears. The testing of the all-electric Land Rover Defender will take place throughout the year while the vehicle officially takes the spotlight in Geneva this month. Of course if you are searching for a used one, the best place to find used cars is through the online auction. There you can put online bids on any cars you like. One of the best websites for this purpose is used car bidding website Abetter.bid. You can press the link and search their Land Rover inventory. And if you prefer green cars - they have used Tesla cars.